My SP8 is Gr8 as I have told you before. I'm so impressed with how she figures out the perfect gift. First and adorable bag that I have to fight my daughters for. Then handmade stitch markers with dragonflies - my favorite. 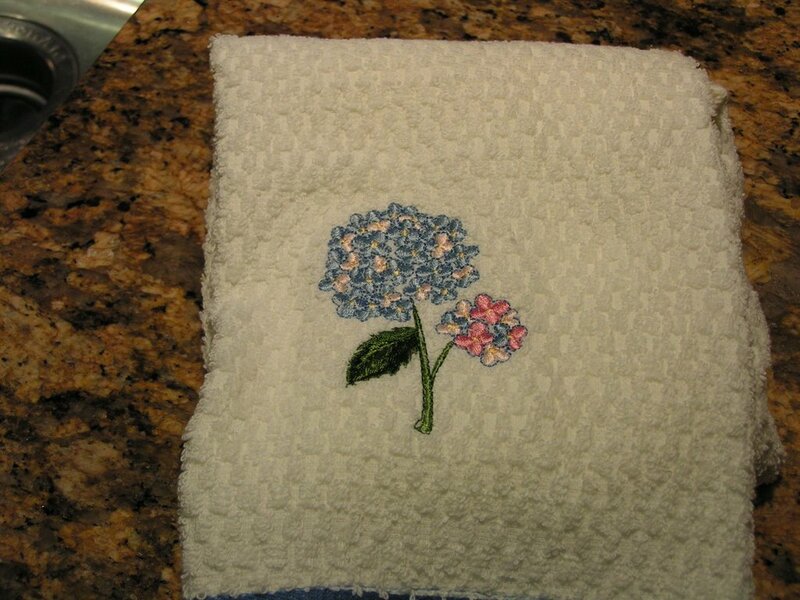 Now a cute dish towel with a hydrangea flower because she noticed one in my photos. Yes I love them and have lots. 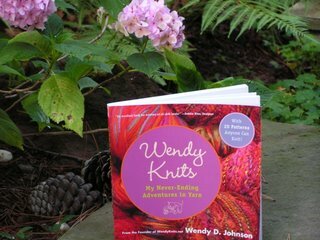 She also sent the wonderful Wendy Knits book. There are lots of great patterns in there that I can't wait to try. How did she know I didn't have it? Brooke - you are the best! Now a brief update on my bag for the Bag Along, I used Lions Brand Cashmere which I really like and the self lining bag pattern from their site but I didn't follow the striping pattern. 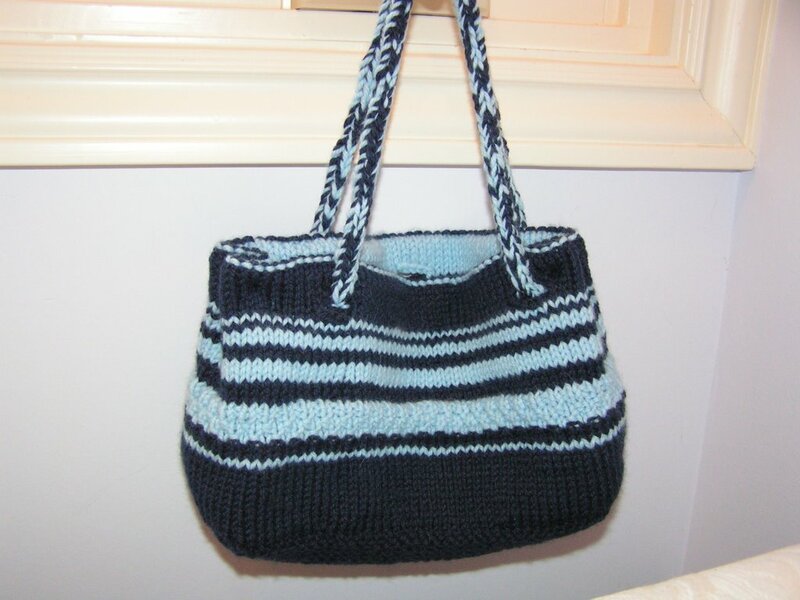 I was so busy making up my own stripes that I didn't realize the bag was supposed to get smaller towards the top! So when I got done it was sort of floppy and the handles holes didn't exactly appear in the right place. 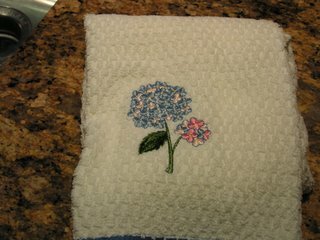 I also wasn't crazy about the handles in the pattern so made up my own. Then I sort of pulled in the sides to make it better at the top. 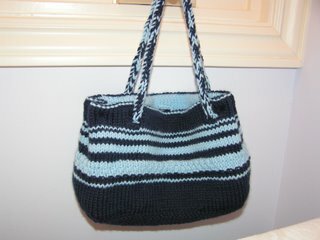 I like the way the stripes turned out but overall am not thrilled with the bag. Oh well - on to the next project! Very similar bag to the "booga bag" I made - made 2 actually. When we do the big "reveal" you'll see them on the blog. I am about to start my biggest project ever! A sweater - heaven help me - i'll need therapy I am sure.